One of the most common complaints we have regarding bureaucratic workings and the pace of progress in any governmental organisation, is the paucity of concern and indolence. Only recently, a few departments have pulled up their socks, as in the case of the Indian Passport Office. However there still remain other departments that need to be woken up. A ray of light has appeared in the garb of an Act, a legal enactment to place more power in the hands of the common man and allow him to combat corruption and indifference. At a panel discussion on the implementation of the Goa Rights of Citizen to Time Bound Delivery of Public Services Act 2013 at the International Centre Goa, the implications for government agents if they did not maintain a good standard of performance were put forth. 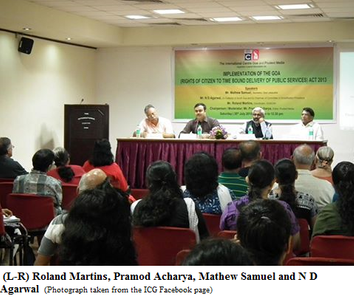 Secretary of Goa Lokayukta, former collector of South Goa N D Agarwal and the coordinator of GOACAN, Roland Martins, were part of the panel with Pramod Acharya, the editor of Prudent Media, acting as the moderator. Madhya Pradesh is the pioneering state where this Act was passed to mandate able and prompt delivery of public services within a stipulated time frame, with smooth facilitation of the procedure and accountability of government servants. In our state, schools, colleges, municipalities, panchayats, Goa Public Service Commission, State Election Commission, and Provederia among others would constitute the ‘authority’ to which the application for public services can be made. Persons living outside the State of Goa will have no access to the Act. The people of Goa are to be notified by the Government about different public services available, time limits prescribed and the officers designated to perform these services. Thus far 497 services have been notified and as a consequence are now obliged to comply with the demands of the Goa Rights of Citizen to Time Bound Delivery of Public Services Act 2013. If the application for a public service is rejected then it is the duty of the designated officer to inform the applicant of the reasons for the rejection, the time period within which an appeal can be made and the details of the appellate authority they need to approach. Mathew Samuel posits that the efficiency of public services is suffering because of the poor abilities of the people who are being posted to government offices. He says the public services offices are not properly staffed as people are failing the examinations required to join governmental positions. Some of the people hired ultimately leave us questioning the educational system, a topic that would necessitate an entire article in explanation. Aside from these problems, the government servants employed are overworked as they take on multiple tasks owing to fewer individuals gaining employment in government departments. In the past it has been a sore point and a gargantuan hurdle that governments and bureaucracies tend to meet their own demands before those of the public. This is a problem noted in other developing countries as well. The general attitude of the government servant would be to serve the higher-ups first, then themselves, and finally the public. Samuel says, ‘We looked up to public servants as someone who can get the job done if you were nice to them.’ This call to accountability did not exist before and so many government servants saw this as an opportunity to exploit the situation to their advantage. Samuel, however, does applaud public services in Goa involving dispensation of birth certificates, income certificates and the like as being highly efficient and delivering even before the time limit set for them. The Goa Rights of Citizen to Time Bound Delivery of Public Services Act 2013, if enforced, will effectively thwart unethical behaviour. Not only will the lax government official be fined, the aggrieved party will be entitled to about 60% of that money. In addition, the government servant will be liable to undergo disciplinary procedures. The concerned appellate authority (appeal court) will also be held accountable for the delivery of justice within the time period stipulated. To enable the optimal functioning of this Act, the public need to be made aware of their rights. Part of this would be the demystification of government processes. The law has now been simplified to make it more comprehensible to the public. To create widespread publicity of the provisions under the Act, information related to the public services, designated officer and the time limit will be shown on the website of the department or office concerned, will be displayed in a noticeable manner in concerned offices, and is published in the Citizen’s Charter and the official gazette. The true power of the Goa Rights of Citizen to Time Bound Delivery of Public Services Act 2013 will be seen in the public’s ability to utilise it appropriately to their benefit and for the favourable functioning of all governmental mechanisms delivering public services.